In late 1861, Confederate General Leonidas Polk occupied Columbus in southwestern Kentucky on the Mississippi River. He broke the “neutrality” of the state and gave Union forces a reason to take aggressive action. Pro-union officers were actively recruiting Kentuckians to take up arms to support their cause and were breaking the neutrality in their own right. Just across the river, in far southeast Missouri, was the sparsely populated ferry landing of Belmont, where the Confederates had set up an outpost. Missouri’s U.S. military commander, General John Frémont sent Brigadier U.S. Grant into the region with 3,000 troops. Grant sent an initial force to overrun the Confederate encampment at Belmont. However, Polk learned of their approach and sent reinforcements who forced Grant’s men out and re-gain control of that section of the Mississippi River. Grant’s plan was to capture the Confederate stronghold at Columbus, but first he had to take the Confederate garrison at Belmont. The 1,000 men that Polk had sent across the river to protect that bank of the river would be no match for Grant’s approaching numbers and Polk sent an additional 2,500 troops across the river to provide relief for his troops on the other side. He wanted to retain control of both sides of the Mississippi. Grant’s arriving force was able to push the Confederates back into a disorderly retreat and scatter them along the river. Discipline broke down within the Northern ranks, who prematurely began to celebrate their victory and engaging in wholesale looting of the Confederate camp. 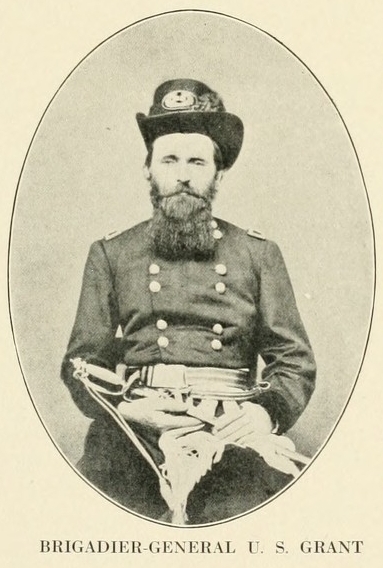 General Charles Smith (who would also serve with Grant at Forts Henry and Donelson) began an advance from Paducah, Kentucky, just to the northeast. He was to make a feint and make Polk commit forces to pursue and keep them away from Belmont. Grant hoped that Polk would believe that Smith’s advance was the primary attack and that Belmont was the diversion. However, Polk recognized the move and dispatched additional troops to Belmont. Five Confederate regiments arrived as Grant was attempting to restore order and withdraw his men back to the river and move to a safer position. Grant himself narrowly escaped capture, but was able to get most of his force back to the boats, cross the river and retreat to Cairo, Illinois. Union casulaties were 120 dead and 487 wounded or captured, while the Confederates lost 105 dead and 536 wounded or captured. Grant realized that maintaining order among the troops was of paramount importance. His men mistakenly felt that victory was theirs until surprised by the Confederate reinforcements. He had been facing General Gideon Pillow, who would later make his hasty retreat as Grant’s troops moved on Fort Donelson.